I cannot remember when I started painting. It happened one day, some day. What I remember is seeing and observing my brother paint whenever he was idle or not so happy. His spontaneous landscapes, his exceptionally appropriate sketches fascinated me and I wanted to be like him. He often gifted these works to many, including my friends, but wouldn’t let me touch them. I felt jealous and at that age the only thing I could do was play with his leftover colours and try to paint one for myself. That was probably the start. By the time I was seven, I was already known in my school for my paintings. I was born into a family of wasted talents. My mother was a gifted dancer and a writer-choreographer, but chose to be a doctor professionally. I had seen her directing musicals when I was a little girl. My father was a very good singer and his paintings still adorn my wall, but he was a policeman. And my artist brother, who inspired me all the way, took up marketing and sales as his profession. As for me, I did my post-graduation in English literature, but I consciously decided to stay hooked on to paintbrushes and paint as my primary mode of expression. Many say it runs in the blood. I agree, yet I strongly believe that one needs to continuously hone whatever is latent inside one’s arcane core. Watercolour and its lucid softness fascinated me. Moreover, I have seen my brother using them, always. My early works were naÃ¯ve and devoid of the contemporary idiom. Their themes were mostly lifted up from something that were around me or something that I had read. At the earlier stage, my main influence was my mother. When it comes to aesthetics, she was my guru. She taught me how to write essays and she read out poems by Wordsworth, Shelley and Tagore. Shakuntala is one of my earliest works. It is done in watercolour and surely expresses a flawless idyllic ambience, inside and outside. While studying English literature, I often felt a strong urge to paint, but my ongoing studies wouldn’t let me. The early nineties’ Calcutta was approachable and friendly. The film festivals opened up new vistas. My introduction to the world cinema changed my existing perspective. I was a small-town girl wandering around and greedily gathering every other wonder! Bernardo Bertolucci’s films had elaborate frames and sensuous colours. I was fascinated. I watched Krzysztof Zanussi, Krzysztof Kieślowski’s and Roman Polanski with bated breath, and was moved by Kieslowski’s Three Colours: Blue. It remained with me ever since. Truffaut and Ray’s black and whites left me wondering as to how just the two colours could create extremely colourful stories. 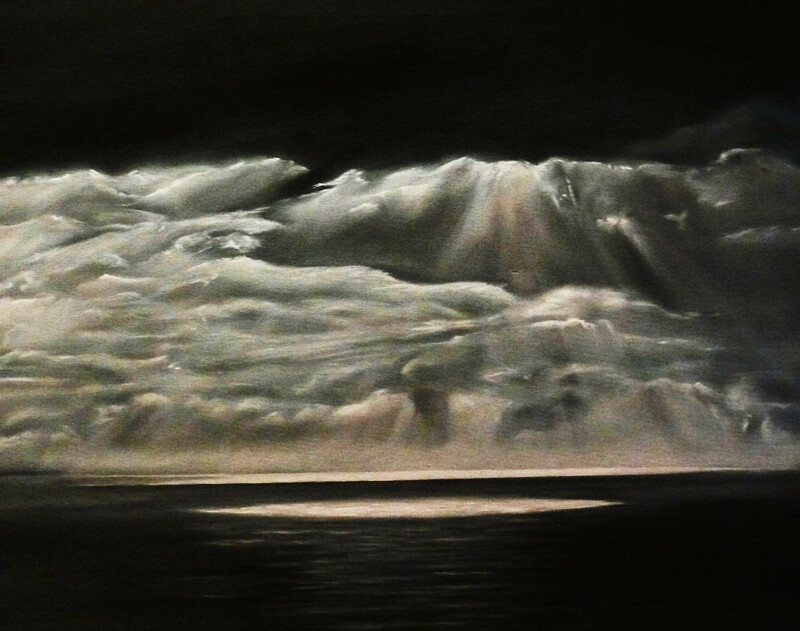 Many of my black-white works are reflections of that wonder. 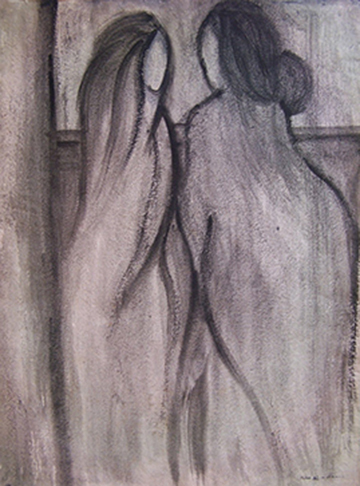 Gossip and Me and Myself: These two are subtle impressionistic watercolour works. Took me barely ten minutes to do them. There is no second stroke or linking lines anywhere. Totally instinctive without a hint of deliberation! 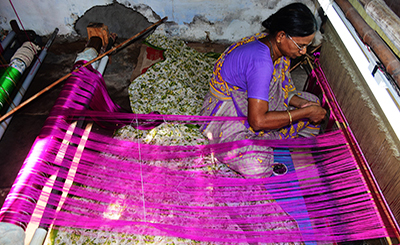 We lived in a small yet extremely cosmopolitan town called Kharagpur, 120 kilometres from Calcutta. It wasn’t an easy distance to cover everyday. I spent eight hours, to and fro each day, to go to my college and university in Calcutta. Not only this distance, I literally swam across a huge crowd at Howrah Station, where I got off the train everyday and took a bus to reach my destination. My eyes floated over a sea of faces with multi-plural expressions and as I journeyed into the nuances of these expressions, I journeyed into myriads of ideas, concepts and ways that were behind each facade. Trains, platforms, railway stations and waiting rooms became part of my everyday life and I witnessed time unfolding in various ways. It was a continuous learning process within, as I watched faces wrapped in wonder, pain, love, hope, fun, disillusionment, all at one go while waiting for a train or while in a train, and my urge to give forms to these experiences intensified. Some days were tough yet they were no less interesting. Delayed trains, crowded platforms, buzzing waiting-lounges, tired faces, sleepy eyes, restless mothers, cranky children, impatient fathers, ladies young and old seeking security, men showing concern ... all rolled up into one continuous story called “life”. Crowd seemed to be my refuge at one point of time. I had lost my father by then. The home to which I was extremely attached, the home that once vibrated with laughter, was no more the same. I somehow wanted to merge with the crowd and get lost in its tide. That was when I realised a crowd has no face, no identity, therefore has no crisis. My painting Facing the Camera is a painting that was inspired by this realisation. 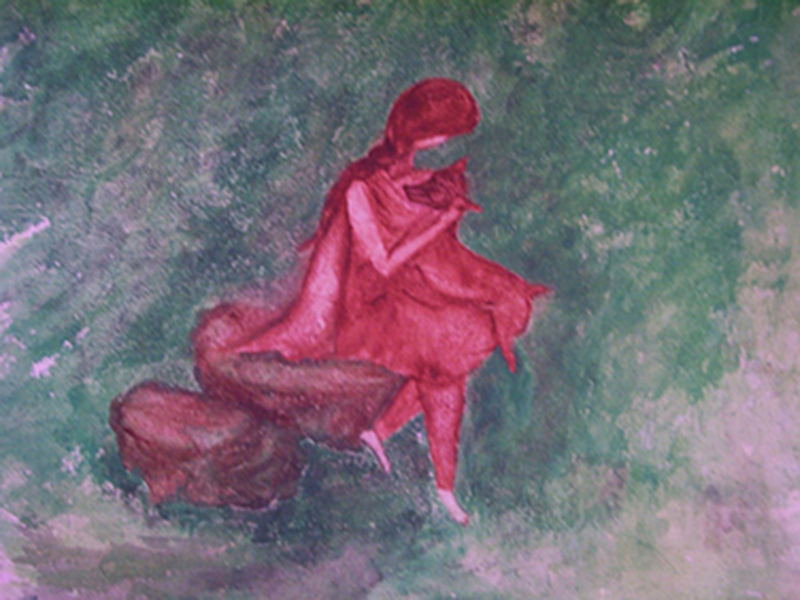 This was my first Acrylic on paper, and I hardly knew how to use this medium, but managed somehow. Surely there is an element of anarchy in the whole of it, which reflects the abyss inside. Staying away from home for most part of the day was a relief, but nevertheless I pined to be home at the fall of the day. My mother was absolutely distraught after my father’s death. So I refused to stay in the college hostel in Calcutta. Instead I preferred to take the long journey back, everyday. I missed my father so much that my whole being became totally dependent on my mother, who I thought would never ever die. I often painted till late into the night and as a result had to miss classes on the days that followed. Faces surfaced on canvases. Initially, I did figures from my everyday encounter. John Keats was a big influence, so was Samuel Beckett. 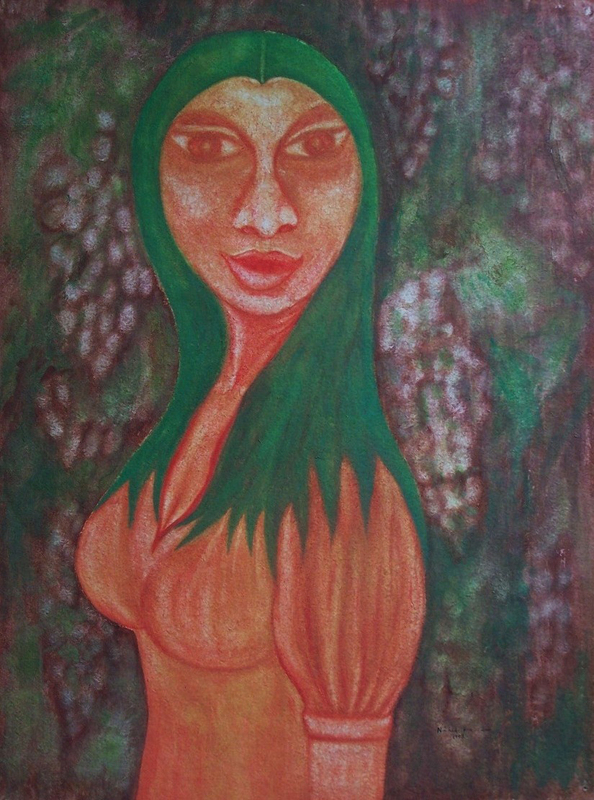 My works titled Mellow Autumn and Waiting for Godot are both inspired by them. 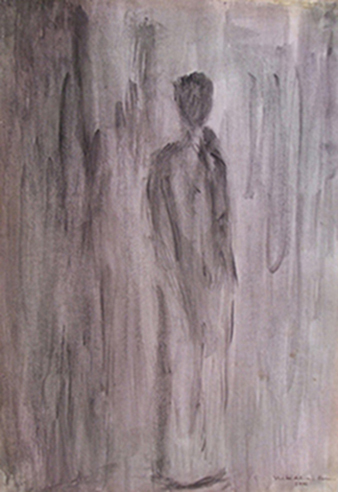 If I have to speak about the two, Mellow Autumn, done in opaque watercolour, is my first expressionistic work, and Waiting for Godot, in mixed media, is one of my early impressionistic paintings. That was a highly insightful time and I started writing as well. I wrote for newspapers and journals. 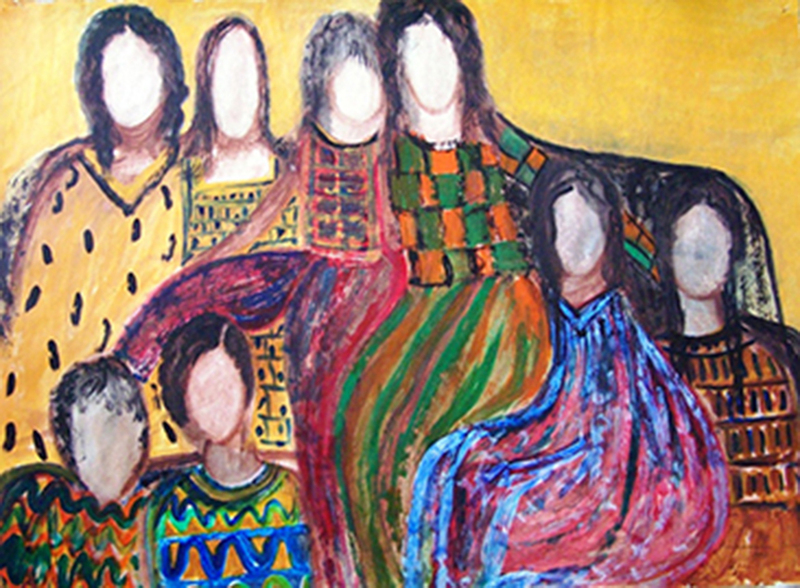 The wide gamut of people that I routinely met inspired me and their huge diversity taught me a new form of acceptance. My father had lost his secured Central government job during the Emergency for something as trivial as a refusal to move to a new posting along with a career lift. That year, we had just moved to Kharagpur from Calcutta. One evening, my father came in with a blank smile and announced that he was fired because he had sent in a protest letter against his new posting in a remote mofussil. Life took a sudden turn. All of us had to condition our thoughts and ways according to the resources available to us. It was a battle both inside and outside. Blue came along. Blue, the colour of the sky and the concept of vastness associated with it, remained with me as I grew up internalising everything that came my way. Born in Calcutta, I was witness to the Seventies’ intolerance and strife. Though I was in my early years, yet the entire Seventies’ era haunts me. Most of my work bears hints to the deep-rooted morbidity that left me spellbound even at that tender age. We had a huge photo of my father in his full khaki uniform mounted up on the wall opposite the entrance door. That was because during the Seventies, houses were searched randomly for Naxalites and that photo was meant to spare us the searches. We always had a full house during those days. Two of my cousins were beaten up, their bones broken into pieces. Young cousins, and uncles, many of whom I did not even know, stayed with us for months on. Ours was a police-officer’s house, a secure shelter. There were times when we were woken up by distinct sound of bullet shots at midnight. A hoarse voice would yell at us and warn us not to peep out of our windows! We heard death-screams that shattered the still night... nights. The sun rose like any other day. Our staircase niche was shelter for many young boys. I heard them whistle and sing in chorus. My mother gave them food and sometimes they would stand at the door with some wheat flour, requesting mother to make some chapattis for them. I wondered who they could be. Mother told me they were sons of mothers like her. I did not understand much. Those unforgettable Calcutta nights and Calcutta days! Fossils is as spontaneous as any instinct could be. I have no clue where it came from, but an afterthought does make me ponder over my early childhood days in Calcutta when I listened to regular discussions of bloodshed and killings everywhere. This painting surely has sub-layers to it. Behind the blue watercolour there is distortion, which justifies its purpose. Kharagpur, in West Bengal, where we lived for the next two decades, was the place that truly shaped up my understanding about growing up. It was my ideal childhood. A red railway bungalow, not far from the railway station, tucked up in the middle of a sprawling lawn with the smell of shirish and shiuli spreading out a springtime spell. A sun-swept bed had that certain kind of warmth, I still feel it all over! How I loved the bedside window with a broken glass! It let my cats in and out any time they wanted to and let the moon wink at me throughout my adolescence. That was the time when evenings quickly cast a huge emerald shadow over our lush green lawn. My parents sat down together over a brewing pot of tea, my brothers playing carom or tuning the guitar for a brand new song. What is the taste of peace like? No extra light to blur out the essential content of darkness, the occasional tring-tring of the bicycle bell announcing homecoming, or the coo-coo of a lonely koel on a Baishakh afternoon — That indeed tasted like peace. That was the time when all of us huddled together and watched the magic of Maradona with mother worrying about missing a good night’s sleep, or missing school and unit tests. Amidst everything, a figure with smiling eyes, in khaki uniform, made us feel secure and safe. His double revolver made him look like a hero and later on we all understood that he really was one. My home, sure that was. 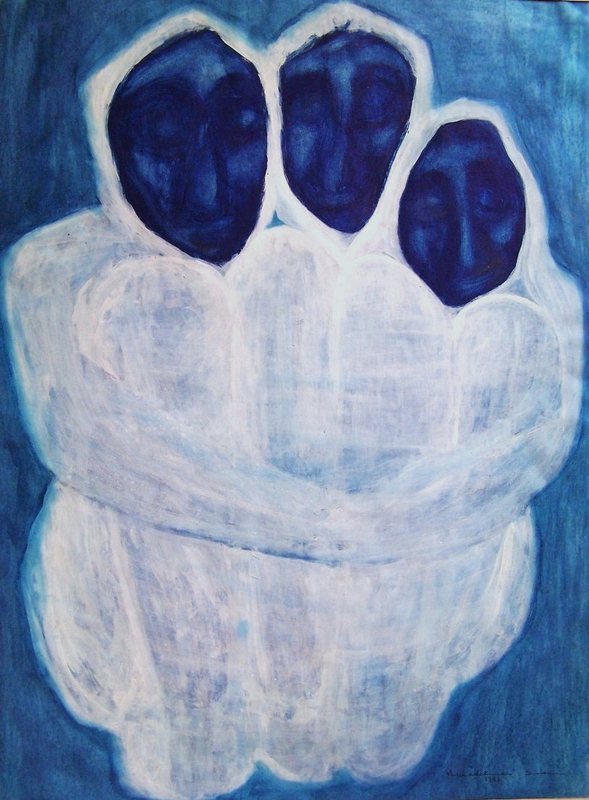 Harmony in Blues, a monochrome I did for my mother, was nothing more than what I felt about the relationship between my parents. An old couple in deep physical embrace, but the whole language defies matter and defines love as a spiritual concept. I had started using dry pastels in mid-nineties. I loved the way the colours blended with each other. But I did not know how to fix the colour permanently, which I learnt later on through trial and error. Some of my favourite works are in dry pastels. 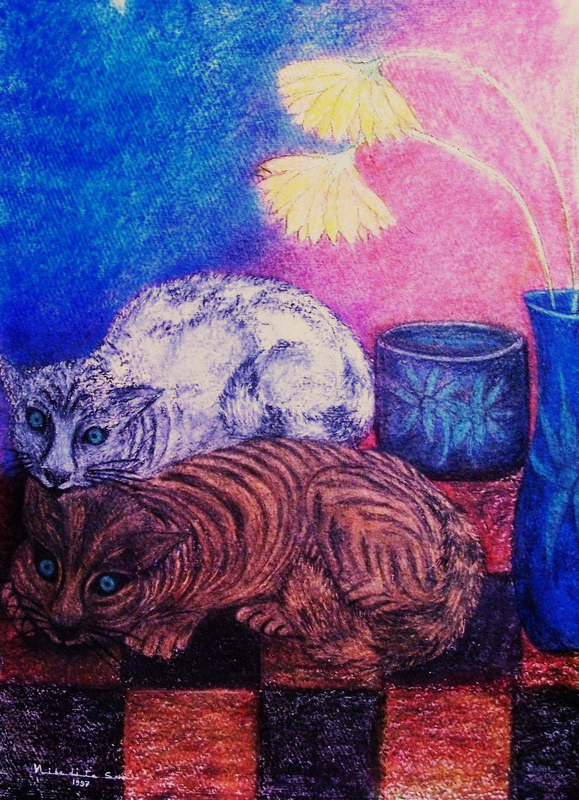 Cats and Dusk are both done in dry pastels in Calcutta, shortly after we left Kharagpur. Cats is a tribute to all my cats I lost in transit. They refused to come along with us to Calcutta. They just disappeared as we started packing up — not to be seen till we left. 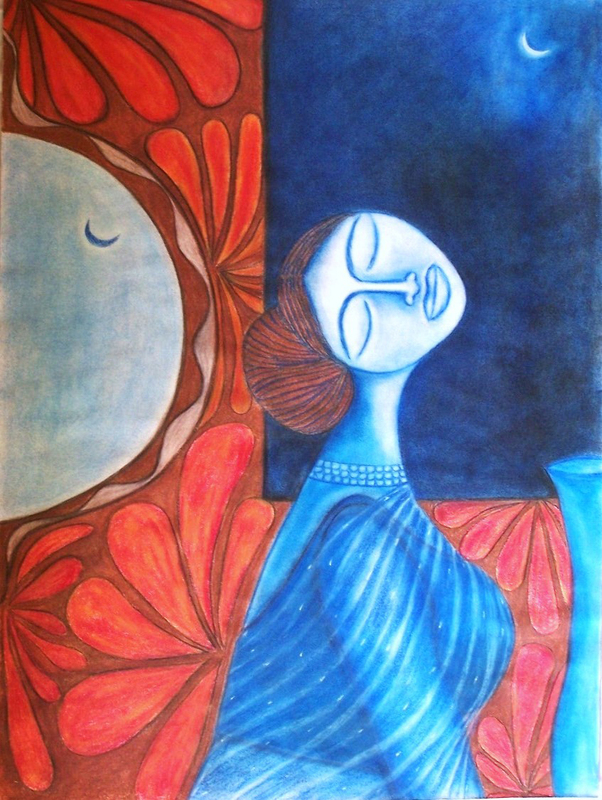 Dusk depicts the harmonious mood shared between dusk and women. Women getting ready at dusk to welcome their husbands home is universal. That everything is impermanent is what I shudder about. I am unable to deal with such essential truths. Be it a bottle of perfume or a relationship, I look forward to a renewal, a replenishment of everything that exists. Over the years the material things seem to breathe and grow along with me. Whether I animate them or they inanimate me is a big question, but my belongings and I do share a common living space, or life, as I understand it. We almost gave up Kharagpur, our blissful abode except for our initial occasional visits, which slowly fell through within a year. A prolonged nightmare about my bereft home wouldn’t let me be in peace for years. The loss of my father and, after him, my mother, made everything go topsy-turvy. I lost my foothold. I lost my childhood forever. That my father died fighting for his rights and my mother followed him were the two facts that ruled my life and overtook all my actions and I consciously refused to move on in life. Our home in KGP slowly vanished. The material things associated with my childhood just got eaten away by time. The Burma-teak-beds and sofas, almirahs and refrigerators, cutlery and crockery, curtains and bed-sheets all evaporated into thin air. No one lived there after my father and mother were dead. All my acquisitions, including my cats, my collection of rocks, shells, leaves, twigs, cotton fluffs, variety of seeds, feathers, dolls and all the precious letters from friends and folks were gone. No one knew where. It took time to recover these material things once again. That was possible only through a magic called regeneration and that happened internally, after many long years of self-reconstruction. 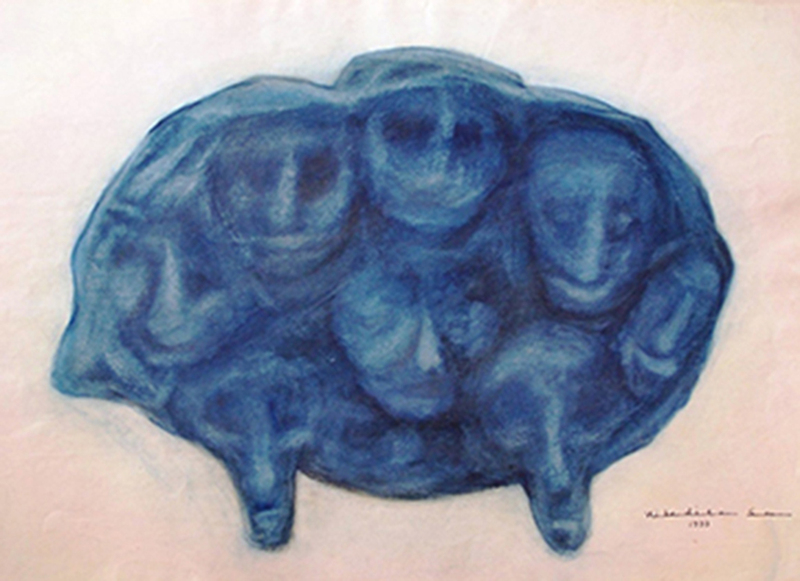 In 1997, I collected whatever paintings I could and had a solo exhibition titled Mood Pieces at Calcutta Information Centre, Gallery Gaganendra. Life suddenly took a sharp turn yet another time that year. I uprooted myself from the earth where I belonged, moved into a new city. Painting was shelved forever. I ventured into an absolutely new world in every sense. Delhi accepted me wholeheartedly and I can’t tell when I became one with it. The rehabilitation of people with disabilities was an altogether new area and I started off my career working with patients with spinal cord injuries at a very renowned organisation in Delhi. Talking to them about life post injury was a revelation. Creative Art Therapy wasn’t common in India in the nineties. I started doing Creative Art Therapy with these patients. Although this is a professionally specialised area, yet I forayed into it purely on the basis of my own sensibility and sensitivity. Eventually, my personal studies and research on the subject took me a long way and led me into newer domains of understanding. I volunteered to work with the orphaned and abused children in my spare time. Learning Braille and working with the visually impaired people was the most positive step taken at that point of time. I started working as a fulltime professional with the blind children at the National Association for the Blind. I got rehabilitated while rehabilitating the disabled. I was reborn with yet another new understanding about life. Nevertheless memories of a home lost in transit came back like a leitmotif. As time passed, I missed home more and more. I tried painting, but couldn’t. Only a couple of them surfaced at one point of time and others kept sinking deeper and deeper every time I held a brush and I wondered when I will be able to paint again. 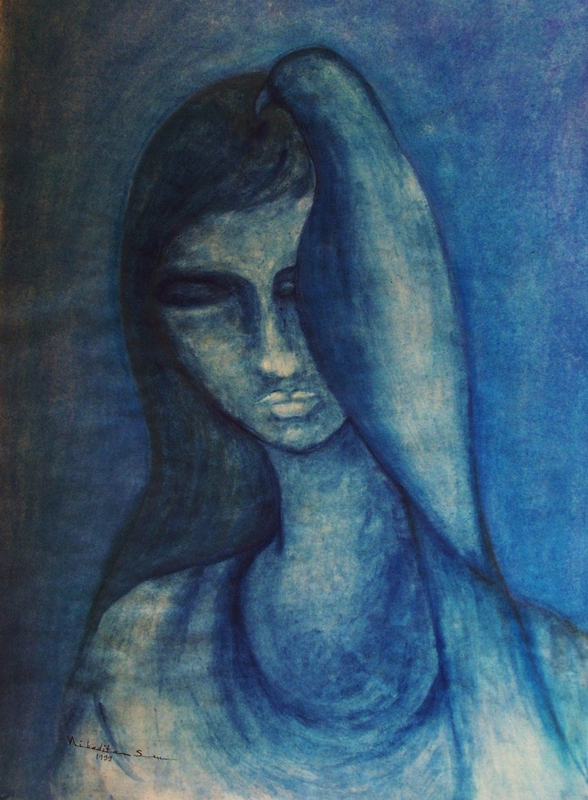 Blue Earth 2, a watercolour, was inspired by the serenity of a visually impaired girl. Her inner eye makes her feel and see beyond the structured. The bird-shaped hair depicts a retreat from the ordinary. The other significant work during this non-productive period is Blue Earth 1. 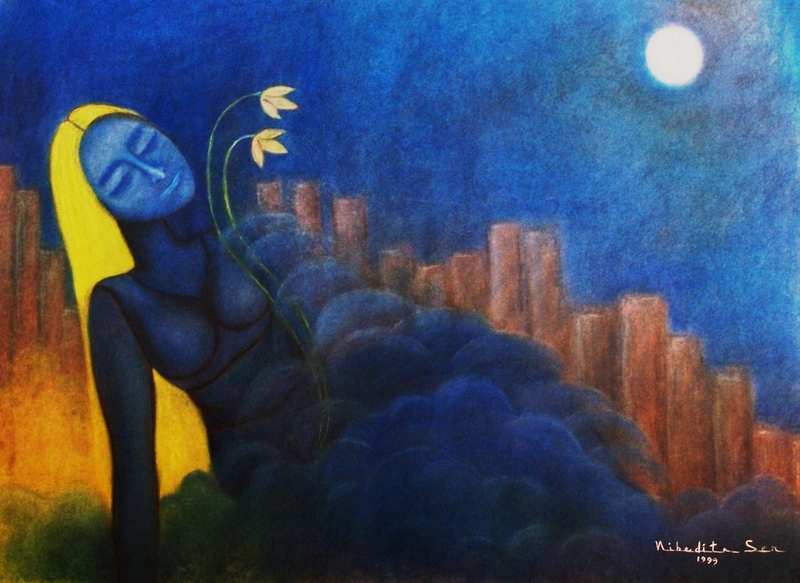 A reflection of my own self rising above the concrete faÃ§ade and pining for the unmixed serenity of my hometown Kharagpur, this is in mixed media on paper. 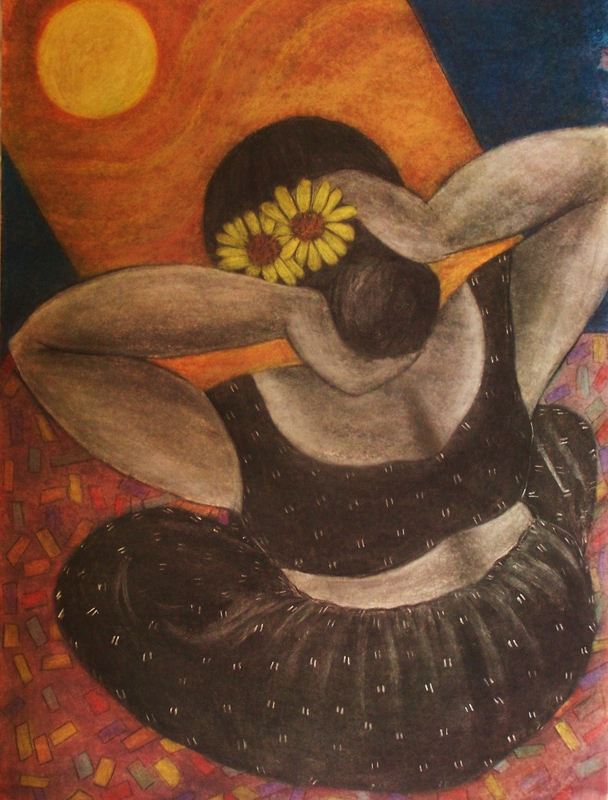 Delhi could not inspire me enough to paint, but I did start writing, eventually. I wrote poetry and also letters addressed to “me”. And it was not difficult to understand that both poetry and the letters were eruptions of the coagulated instincts due to repeated concussions. Reading my poetry at several public readings did make me happy to some extent, but no one knew that I paint too. 2001 arrived as a significant year. A work-based research on deaf and blind people took me to Germany in 2001. Two solo exhibitions were arranged in Germany by a well-wisher in the same year. And a chance meeting with a seafarer in 2001 made us mates forever. I resigned from my job in order to go sailing with my Master-mariner husband. I sailed for months in deep sea on huge oil tankers. I was suddenly part of a vast expanse of unending blue! My concrete calendar vanished into the ever-flowing azure. All directions, dates and hours dissolved into a monochrome blue. It was anachronism, a phase lifted up from nowhere and fitted into a jigsaw life. I journeyed in and out, watched numerous shades of blue merging into one another effortlessly. Countless hours went by. It was ecstatic. 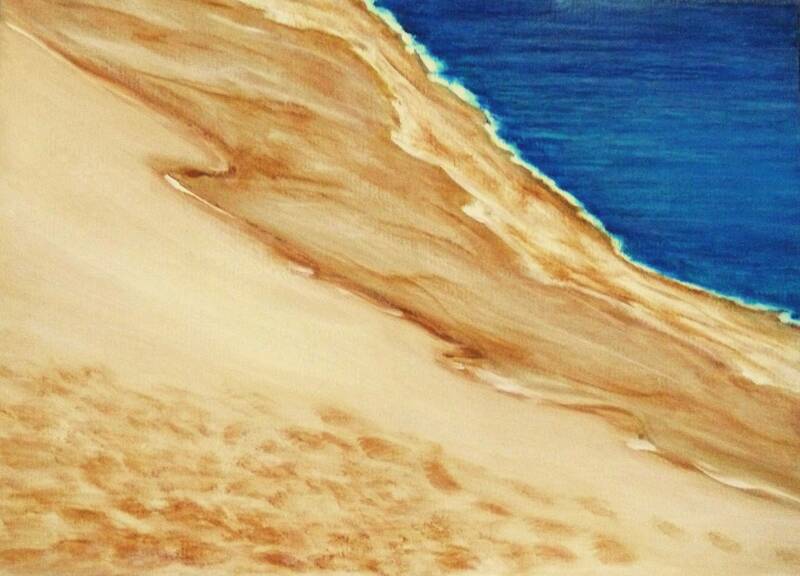 Blue Earth 3, done in mixed-media, expresses my ecstasy on being exposed to the bare nature. 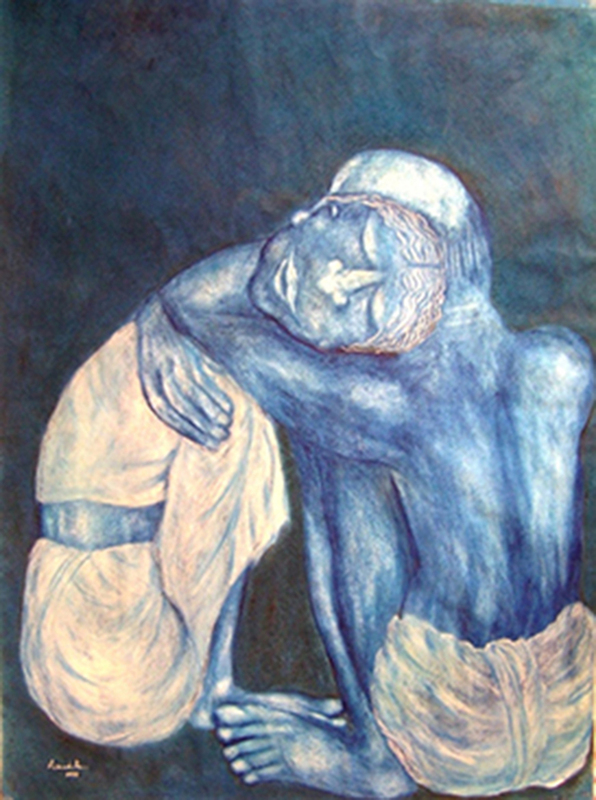 Love is a mixed media work and expresses a mood, using the Indian archetypal colours associated with the concept of love. It was like the peace that I had once experienced long ago! But here mornings were bathed in fresh red and evenings were vermilion over an emerald mirror. Seagulls cried and circled the distant mast while I sat on the sill of an airtight porthole, trying to imagine whether their calls are as sweet as the cuckoos’ at home. Nature became an unending source of recompense and its unconditional love and human touch replenished my soul. Year 2007, and, as providence would have it, once again, I was hurled back into a dungeon of unending darkness and this time the pain was excruciating. 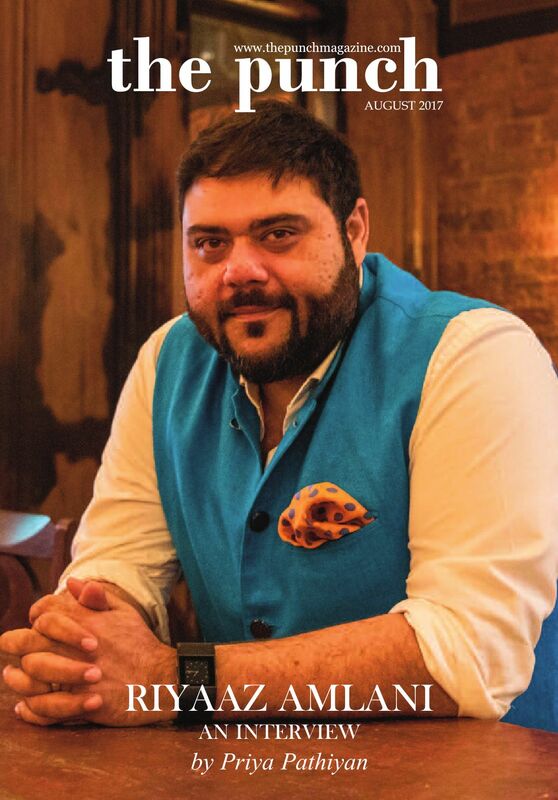 The sudden loss of my dearest brother, my mentor, made me totally vulnerable to everything that reminded me of him. For the next four years, I lost all contact with canvas and paint. Wrote occasionally — it was easy to scribble a sentence or two or doodle a few fragmentary words. Faces formed and vanished everywhere, in mid-ocean, in clouds, in sleep and also in wakefulness. They walked me through memories, which became involuntary impulses. On most nights, I stood all by myself on the top deck looking into darkness. And on one such night, as darkness enfolded me completely within its sheltering black, I became distinctly aware of the light each twinkling star showered on me. It seemed to pierce me through and through. The exhilaration followed as I voyaged again and again, inside and outside, from troubled zones into a realm of calm. Many such voyages happened. And I steadily moved on from the world of worrisome questions into a zone of comforting exclamations, from witnessing temporal life to perceiving infinite eternity. In my paintings, forms made way for the formless and the figurative metamorphosed into the abstract. The genesis of a new series of paintings and installations happened within a span of three weeks. Sailing through this endless sea for ten years and more culminated into The Sea-Inside series. All of which was done onboard oil tankers. Later, the series was showcased at Renaissance Art Gallery, Lalit Kala Akademi and the India International Centre. In 2013, it travelled as a solo exhibition to London, National Art Museum, Palais De Glace, Buenos Aires, Fundacion CEP, Belgrano, Pasos Perdidos, the Heritage Salon, Congreso, Parliament Buenos Aires. Sea Inside 9 and 10 are both done in acrylic on board. I did them while I was on board. Once at midday, I watched a single ray of light burst through thick black clouds to form a neat spotlight on the dark sea-surface. This was Magic for me! From the Mediterranean to the Black Sea, from the Pacific to the Atlantic, many such spontaneous magic held me mesmerised and mystified all the time. After a gap of six years, I started painting once again, occasionally exhibiting my work when I wasn’t sailing. 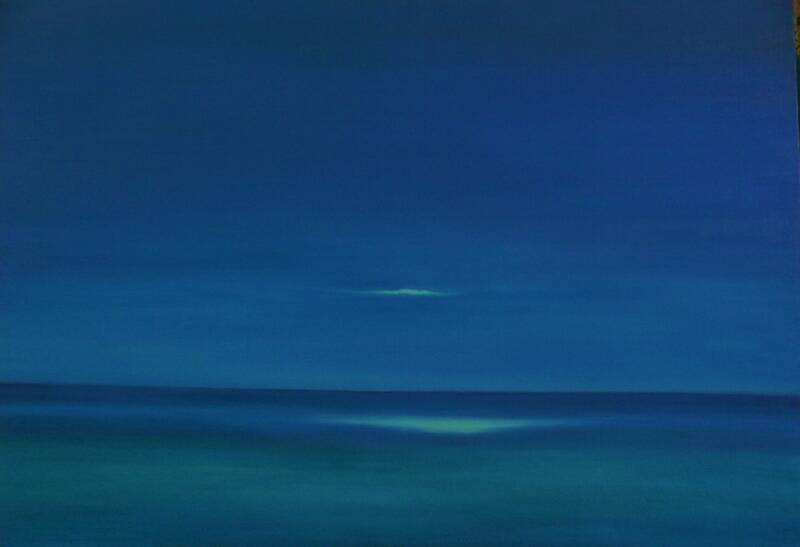 Sea Inside 22, done in oil this work, is a tribute to the midday magic I was witness to on the Pacific Ocean and a few times on the Japanese Sea. 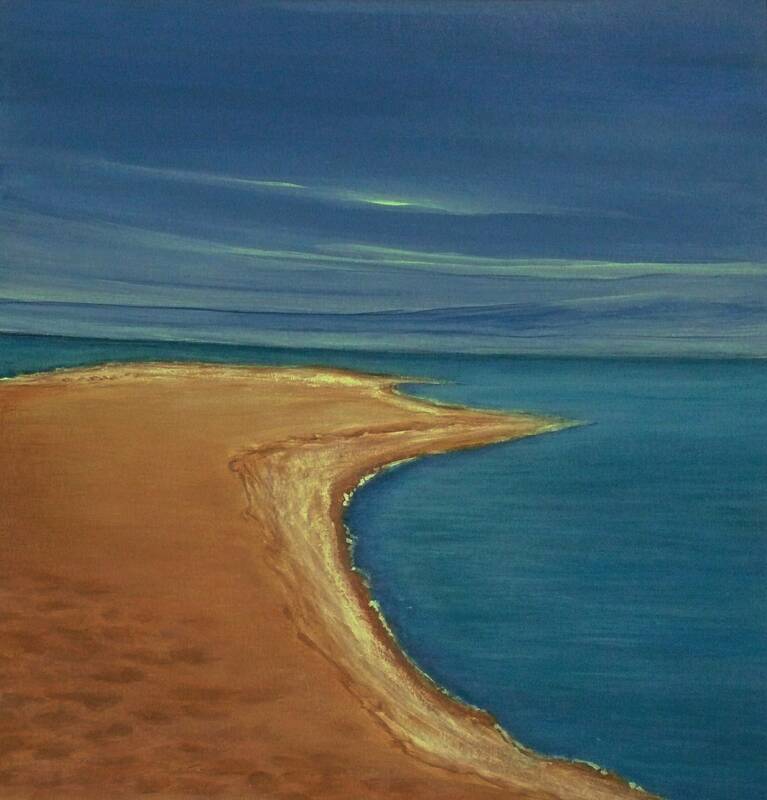 Sea Inside 15 is in acrylic on canvas. The sea is in a meditative mood. The mystic light reassures regeneration and reconstruction of hope. As I rewind my seafaring decade and as I see the whole range of my sea-paintings now, I clearly observe a parallel psychic journey through the wilderness of life into an open space of joy and hope. As I journeyed within through rough times after the great personal losses, I also literally voyaged outside through phases of disturbed blues into those that are more soothing. Stormy nights through the Great Australian Bight eventually brought us to the soothing Mediterranean. My understanding that all matter exists “within itself and beyond itself” was a revelation and my installation justifies this. My first flight ever was from Calcutta to New Delhi. What instantly fascinated me was the slowly dissolving landscape, which became more and more distant, more and more abstract — more and more equivocal. It was from this that I got the idea for my installation. The huge buildings turning into structures lesser than matchboxes; human beings looking like insects creeping around; the Ganges turning into a strip of gray-blue ribbon and eventually dissolving into nowhere. This first impression perspectives from heights remained with me forever. The aerial view from Bangalore to Sri Lanka was breathtakingly beautiful. I was mesmerised by the variegated blue strips forming abstract patterns on beds of yellow and white sand with a skirting of lacy foam and transparent coral around waterbeds. It was stunning and ambivalent. This aerial-view of the land-water-masses from different heights intrigued me into delving deeper into perspectives of sight and visual ambivalence. Bosphorus was stunning from the top! So were the Mediterranean, the Black Sea and the coasts of Australia, including the Great Barrier Reef. Much later in time, I discovered a microcosmic equivalent in cross-sectional slices of agate stones. Done with blue agate stones, seaweeds and fibreglass, this installation is an extendable collage. It is in two parts: The Ephemeral and Matter and Beyond. I focused on minimalism and beauty. Since I was dealing with an extremely beautiful natural perspective and since it is difficult to better something that is so perfect, therefore, I kept it simple. Apart from demonstrating natural splendour, this work demonstrates the concept of microcosm within the macrocosm. All matter is ephemeral yet eternal and the perimeter that we attribute to matter is an illusion — it exists in itself and also beyond itself. This installation was showcased in a solo exhibition in 2014 at the India International Centre, New Delhi, and instantly loved by critics and art lovers. It did take time to recover the lost things. And as I had said earlier, it was possible only through a magic called regeneration and that happened internally, after long years of self-reconstruction. Yes, self-reconstruction did happen as and when I learnt to think beyond matter. I know and I believe that all was mine and all I lost exist within me and also beyond me. I touch them, see them, hear them, smell them and taste them whenever I want to. It is easier now. And it is Magic! I read- My Journey: Seeing Inside. This is an impressive piece of writing and well written article that strikes the inner chord of our life. It is very powerful, real and creative journey description... I liked what Nibedita Sen wrote, "one needs to continuously hone whatever is latent inside one’s arcane core." This is so true as Nibedita talks and shows through her life how the wasted talent can be channelized in doing something extra-ordinary. "I was a small-town girl wandering around and greedily gathering every other wonder! There is a honestly, vulnerability and also gives a hope to those who are often kept away from the happening of a big city.This statement really stopped me and made me to ponder, "I somehow wanted to merge with the crowd and get lost in its tide. That was when I realised a crowd has no face, no identity, therefore has no crisis." So beautifully articulated yet conveys the reality of our life and the pain we often undergo and how we try to cope with it. The paintings are very soul-touching indeed. "Surely there is an element of anarchy in the whole of it, which reflects the abyss inside." There is depth in what Nibedita is writing here. "That everything is impermanent is what I shudder about. I am unable to deal with such essential truths. Be it a bottle of perfume or a relationship, I look forward to a renewal, a replenishment of everything that exists." Very few writer are able to go to such extent and able to give words to the unknown parts of us that we struggle with often. "I got rehabilitated while rehabilitating the disabled. I was reborn with yet another new understanding about life." This is so true and very counter-cultural, where often we are told to surround ourselves with successful people to become successful but the way God connects us with broken people to help us see our mess so that healing can take place within us, because in there we find meaning and wholeness, as the scripture says, "For whoever wants to save their life will lose it, but whoever loses their life for me will save it. "(Lk 9:23) There is so much this article connects and rhymes with our life chord as Nibedita Sen rightly puts it, "The communion was deep. Each restless chord was being slowly tuned into a harmony that resonated with the cosmic rhythm." Great writing, thoroughly enjoyed it!! !